in NCI-Emanu El Congregation, 2012. Sergio Brukman is chairman of the Judaica Foundation. What should travelers not miss in your city? Buenos Aires has so many great cultural sites and activities, it’s hard to choose what not to miss. At Mayo Square, you’ll see the famous balcony of the government house from which Argentinian President Juan Peron and his wife Evita saluted the crowd in both the musical and the movie “Evita.” The building and balcony are open to visitors, so you can have a photograph taken of yourself in the guise of a beloved 1940s political leader. The portside neighborhood La Boca, which was the gateway for thousands of immigrants—most of them Italian—in the early 20th century, is now the place to go to see shows of live tango—our local dance—on the streets throughout the day. Many people don’t realize that tango started in the brothels here and originally was danced solely by men while waiting for “social services.” The houses still have the Italian imprint of those immigrant years, and you can visit the ones called “conventillos,” which served as small hotels for arriving families. Palermo Park, designed by the famous French architect and landscape designer Charles Thays, features lovely botanical gardens and the Palermo Zoo. After being refurbished in the ’90s, the Puerto Madero neighborhood, once the site of abandoned customs warehouses, has now become one of the most beautiful and upscale areas of modern Buenos Aires, with many great restaurants offering a wide variety of food. And don’t miss Tigre, a beautiful river-side city about 20 miles north of Buenos Aires, where you can visit an estancia (a local ranch), complete with traditional asado (BBQ), horseback riding, Argentinian folk music, dances, and demonstrations of “gaucho” (cowboy) skills. What Jewish sites are most worth visiting? Start with the synagogue of Libertad Street, which is what everybody calls it, although its official name is Congrega-ción Israelita de la República Argentina (Jewish Congregation of Argentina). In 2013 the synagogue celebrated the 150-year anniversary of its hosting the first registered minyan in Buenos Aires. Formerly Liberal, it is now a Conservative congregation welcoming people from all religious streams. In the same building you’ll find the Buenos Aires Jewish Museum, documenting the Jewish experience, and the Judaica Foundation, a network of Jewish institutions representing all religious streams in Buenos Aires: synagogues, a school, a Jewish gay organization, Jewish community development, social services for the general community, etc. The Foundation enables organizations with very different ideologies to focus on common goals—a unique model of cooperation in the Jewish world. While each institution is independent and autonomous, together they solve problems, share experiences, promote one another’s activities, and build community. In the Jewish neighborhoods of “Villa Crespo” and “Once” you’ll see Jewish schools, synagogues, and Jewish residents going about their daily lives—and police stations with Hebrew signs. Another neighborhood populated by Jews in the last couple of decades is Belgrano, home to both the Progressive NCI-Emanue El Congregation and the Arlene Fern Community School. Other must-sees are the Israel Embassy square and the Asociación Mutual Israelita Argentina (AMIA) building, where the terrorist attacks took place in 1992 and 1994. Rebuilt on the original site, the AMIA building is now a cultural memorial featuring a work of art designed and donated by Israeli artist Yaakov Agam. Be sure to book your visit in advance, because for security reasons unregistered people are not allowed to enter the building. If you have time, leave the city and visit places such as Entre Rios and Santa Fe, where Jewish colonies funded by Baron de Hirsch were established in the 19th and 20th centuries. Eastern European Jews resettled there and farmed the land. They became known as “Jewish gauchos,” the Argentinian equivalent of cowboys. Today, 30 Jews still live and work as farmers in the very last settlement within the small town of Avigdor, 300 miles north of Buenos Aires, established in the early 1930s as a shelter for Jews escaping Germany. Our Judaica Foundation is working to rescue the colony by building schools, a cheese factory, a medical center, and a camp where youth can learn the story of Jewish immigration to Argentina. On the way to Avigdor, stop at the village of Dominguez and visit the Museum of the Jewish Immigration to Argentina, where you can learn about the immigrants’ daily life and their contributions to Argentinian society. Although Buenos Aires is safer than most cities in Latin America, some extra care won’t hurt. Try not to take personal valuables while you’re touring, and ask your hotel staff about recommended places to go and not to go. In Buenos Aires you don’t have to be afraid, but you have to be careful. What are great local dishes? The asado (local word for a BBQ) is both tradition and a source of pride. I recommend the restaurants Cabaña Las Lilas, La Brigada, and La Cabrera. And because Italians are one of our largest immigrant communities, finding good pasta restaurants, such as La Parolaccia or Sottovoce, is as easy as finding good meat. Plus, don’t miss the pizza at Banchero, Güerrin, or Las Cuartetas. Just don’t expect the pizza you’re are used to; ours is thicker, and no “extra cheese” is required! When did Progressive Judaism begin in Buenos Aires? It started at Emanu El Congregation in the early 70s. About 12 years ago the community merged with NCI and today is known as NCI-Emanu El Congregation. We now have a second beautiful Progressive congregation, too: Mishkan. About 200,000 Jews live in Argentina, nearly 80% in the greater Buenos Aires area. 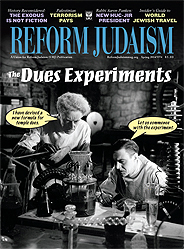 Currently Conservative Judaism is the biggest religious stream, but I think Progressive Jewry has a lot of growth potential, as long as we continue to be welcoming, inclusive, and spiritual; encourage people to be actively involved; and adapt what we offer to the needs of Jewish families today. Jews are already drawn to our congregations because of the feeling of community: the personal relationship with the rabbis and the sense of living their Jewish lifecycle in community. We say that we build community through our actions, and we behave according to this saying. Our cultural tradition bids us to make sure that every person who comes to one of our synagogues feels a sense of belonging. People tell us it is easy to become part of our mishpuche (family). Music is an essential part of services. We mix Ashkenazi and Sepharadi melodies, using Shlomo Carlebach music as well as music composed by our own people. Keyboards, drums, violin, etc. are always present on Shabbat. Women can wear kipot and tallitot and of course we all sit together, as services are moments to share with the whole family. In our siddur (prayer book) all the texts are written in Hebrew and Spanish, and the Hebrew songs are transliterated. Our rabbis deliver strong divrei Torah and create an atmosphere of togetherness. Our lay leaders play an essential role as well, educating each new generation in the spirit of community service. As our grandparents used to say, our services are a mechayah (a great pleasure), and we invite any visitor to take part in them to confirm this! What are your most popular holiday celebrations? The High Holy Days, for sure. At the end of Neila, the lights are turned off, and the children enter with Havdallah candles while the congregation sings niggunim (wordless Jewish melodies) in the dark. When the shofar is blown with t’kia g’dola, you can feel the energy of a community praying together. The service ends with everyone singing “Hatikvah,” the Israeli national anthem, as a symbol of our commitment to Israel and our hopes for the next year. What else is unique about Progressive Jewish life in your city? We Argentinians are very passionate in everything we do, and being Jewish is part of this passion. You see this, for example, in our major identification with the State of Israel. We joke that the strongest religious stream in Argentina is Zionism. I hope you come to Argentina, as you will have a great vacation experience. And don’t forget to visit us. We’ll be honored to receive you.